Last Saturday (05.21.16), I attended and facilitated a session at Tomorrow’s Classrooms Today on the campus of Rider University. It was a great opportunity to spend the day with some wonderful, like-minded educators (gratuitous name dropping begins in 5… 4… 3… 2… 1…) fellow colleagues Stacey Lindes and Melissa Morris-Inoa with Twitter friends Chris Nesi, Dan Whalen, Dani Kennis, Adam Schoenbart, AJ Bianco, Sandra Paul, Kim Mattina and many others. The conference kicked off with a powerful keynote from Will Richardson who spoke on the need to modernize our educational system to match our beliefs. Now, I completely agree, it’s just this is a message I have heard several times from other speakers. This setting is almost like preaching to the choir. I find it hard to keep sitting through speeches like this when we don’t have the actual power to change the current practices. State and federal testing must occur. We have to teach the approved curriculum. Wait, this isn’t a soapbox rant post, so I digress. 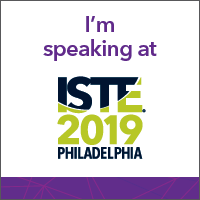 The sessions I selected to attend were: ‘Flip the Faculty/PLC Meeting’, ‘Make Feedback Better & Easier with Google Forms & Sheets Add-ons’, and ‘Creating a Cross-curricular Student Broadcast’. Each had their own takeaways and tidbits of information that I never knew about. During the third session, I led ‘Students as Creators’ (embedded below). Lunch was a nice amount of time with a delicious spread. It gave us all a chance to either visit the makerspace, meet with vendors, or just talk with other educators. All in all a nice day and something I will be on the lookout for next year. I’ve heard back from some of the attendees on how they have tried what I showed, as well as here are the Tweets that relate to my session. I embedded the Tweets below. @Gallagher_Tech @ThingLink_EDU thank you! Definitely! Loved having time to “play” too! @Gallagher_Tech Great talking with you today! I enjoyed your session too! I am going to download the LegoMovie Maker app onto the iPads. playing with awesome tech tools w/ @Gallagher_Tech @ThingLink_EDU, green screen and Lego Movie Maker #TCT16 #inspired!